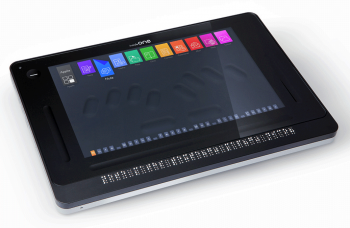 Touchscreen braille PC tablet with 32-cell refreshable braille display for the blind (DeafBlind) and visually impaired people. 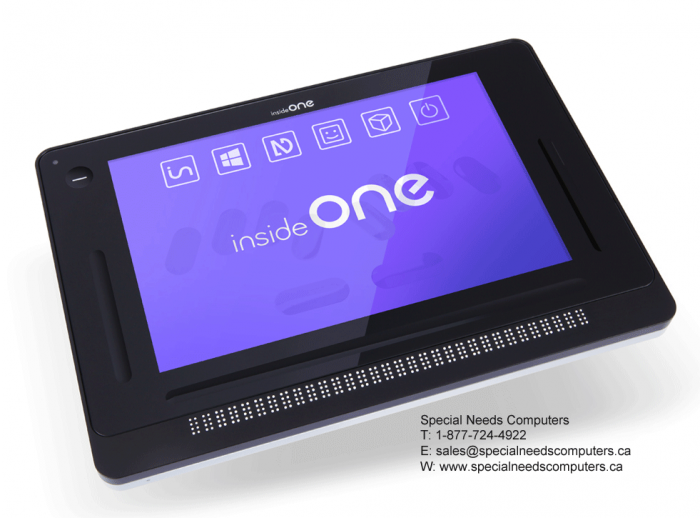 insideONE is the very first tactile Windows-10 tablet with a fully integrated, superior quality 32-cell refreshable braille display. The proprietary, patented tablet is designed for the blind, but can be used by a wide spectrum of people including sighted people. insideOne is a full-functioned powerful, mainstream computer which offers unprecedented flexibility and ease of operation. Users can write choosing Braille or QWERTY keyboards and they can read files on a refreshable braille display or on the 10-inch HD screen. They can utilize the full power of Windows-10 OS with all its compatible applications or choose insideONE’s proprietary Home environment which hosts a suite of easy to use, intuitive and instantly available applications to take, manage, and share notes. 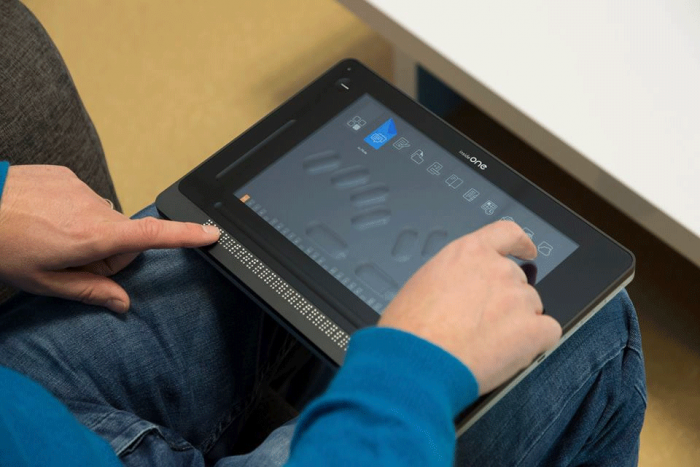 insideONE is an all new kind of tablet which unites the world of Braille and print. Braille input is instantly displayed on a screen allowing sighted people to have visual access to what was Brailled and anything typed on the screen is available on the refreshable Braille display. Parents and children, teachers and students, blind and sighted coworkers can collaborate effortlessly. Every interaction becomes more intuitive, more rapid and more fluent. The sighted and visually impaired can finally share a common space for interaction and collaboration. 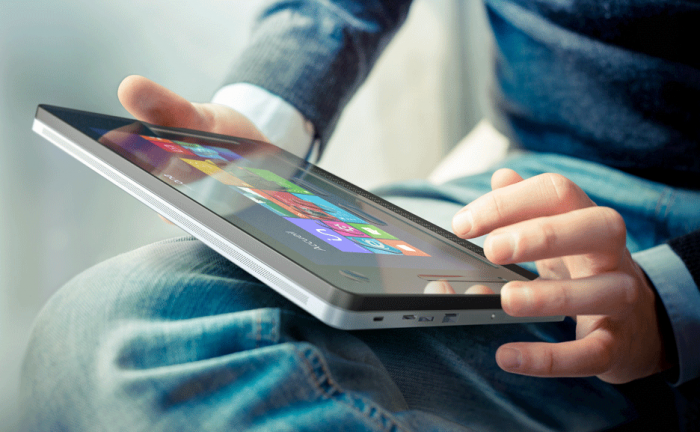 Powerful Windows 10 tactile tablet with integrated 32-cell refreshable braille display – all in one. Unique Design Approach optimizes insideONE for universal use. Clean, simple and minimalistic to ensure extended, comfortable use. Hyper resistant touchscreen to provide shock, scratch and water resistance. Perkins-style Braille keys are engraved into Gorilla Glass ® offering an easy way to correctly position one’s hands . 10’’ HD Screen for use by those who are sighted. The screen can be darkened for privacy, or to conserve battery life. Use of familiar smart phone-like hand gestures. Each hand action provides a user with visual, auditory and tactile feedback. Instant Translation from Braille to Text and back. Enables instant communication between blind Braille users and sighted people who do not know Braille. Multiple languages and Braille grades to choose from. Instant visual representation of Braille input in text and SimBraille. Blind and tactile what a paradox! Doubting our hands would be incredible. Who if not non-sight people are more hypersensitive to the sense of touch. A new tactile language brought into the Braille world. Everything turns more intuitive, quicker, more fluent. Sight and non-sight together, a world in common for obvious interaction. Great for the DeafBlind community. A product imagined to remedy the visual deficiency, that can be used by all of us, bridging the visible and invisible world gap. We lead our lives in the same surroundings, in homes, schools, offices, we wish to learn, create, play and work everyone together An opening to facilitate the expression of our inner life. Usefulness both with simplicity. A bi-acurate tablet available at every turn of your life. No need to be a braille expert, the insideONE tablet offers an unprecedented access between sight and non-sight. It can be shifted between environments allowing us to work and discuss on the same document in a data-processing world over which we both have control. Built of the best materials its self-coloured case made of aluminum alloy is machined to one tenth of a mm, yielding an exceptionally precise part with a smooth finish. An hyperresistant tactile glass made up of Gorilla Glass, twice as strong, as any other type of glass, the utmost for shock and scratch strength plus water-repellant treatment to confer an even better feed. We employ noble and recyclable material, to prescrive the environment. Carefully selected components guarantee optimum durability, whilst preserving their technology. A perfect match between practice and performance. Speed and power are no more a problem. The quad-core Intel processor delivers the very latest performances and this with optimal consumption. Top of the range architecture allows for all possibilities. The 10.1 inch full HD screen plus the 12.3 inch matrix, never seen before on a tablet, enlarges sensing all the way to the product edge. Your contents easily transferred and transmitted to all your peripherals. InsideONE includes HDMI, USB 3, mini-USB ports, an in-out audio plug, an internal microphone, a micro SD card reader and embedded speakers offer Dolby stereo. You wish to listen to music, to project images on to your HD TV via the minidisplay Port or to connect with an external monitor hard disk, a movable storage support… or any other equipment, there will always be a solution. To exploit to the full insideONE performance capabilities we have provided a high-capacity Li-Ion battery. A 128Go EMMC storage expandable to 384Go, reliables noiseless thru the Flash memory technology. Fitted with 2 automatic focus cameras, one of 5 megapixels in 1080 HD and the other of 2 megapixels frontal. Communicate with Skype or scan your documents with your preferred OCR. InsideONE is your eyes. With 32 braille characters to offer comfortable reading like a braille page, rediscover the feel of paper whilst enjoying automatic reading follow-up, moving to the next line. InsideONE the tablet as efficient as a desktop computer, without the noise in the absence of a fan but with extra reliability derived from its concept with no mobile parts. Engraved braille keyboard into the Gorilla Glass©. Screen with built-in 32 cells braille display. Browsing functions and tactile routine cursors. Braille keyboard: inlaid into the touch screen. Processor: INTEL Quad Core Z3775 2,4 Ghz - Intel HD graphic (gen 7). Memory: RAM 4 GB LP DDR3 - ROM 128 GB. Supporting Micro SD card up to 256 GB. Operating System: Windows 10 Home 64 bits. Buttons: physical On/Off - High and low volume. Ports: Micro USB, Mini USB, USB 3, Mini HDMI, 3.5 mm audio jack. Cameras: integrated front 2MP - integrated back 5MP. Usage time: Up to 8 hours. Connectivity: WiFi IEEE 802.11 a/b/g/n/ - 5G. Charger and power supply cable 5V - 220V. in.Home software - Discover new ways to interact, through the in.Home range of tactile softwares. in.Math software: Discover the mathematical software on the tactile braille tablet insideONE in.Maths©. Insidevision Inc. warrants this device to be free from defects in materials for a period of two (2) years from the date of purchase, as evidenced by the purchase receipt. During the warranty period, Insidevision Inc. shall repair or replace the device at its own discretion with a product of equal value. The warranty does not cover damage resulting from vandalism or abnormal use of the device. Warranty terms are subject to change. insideONE is delivered with the Teamviewer software preinstalled to enable remote troubleshooting to resolve issues. In cases where the Distributor is unable to resolve the issue the device should be shipped to Insidevision Inc. for repair. Please note that you must advise customers to keep the original insideONE cardboard packaging to ensure safe product shipping. To help the Distributor offer after-sales service, we offer a 2-day training session in insidevision’s offices or Via Skype. We also provide an instructional guide on how to service insideONE. Please note that you must advise customers to keep the original insideONE cardboard packaging to ensure safe product shipping.